Libraries are places where things are kept: old things, new things, things that will be of interest to others. 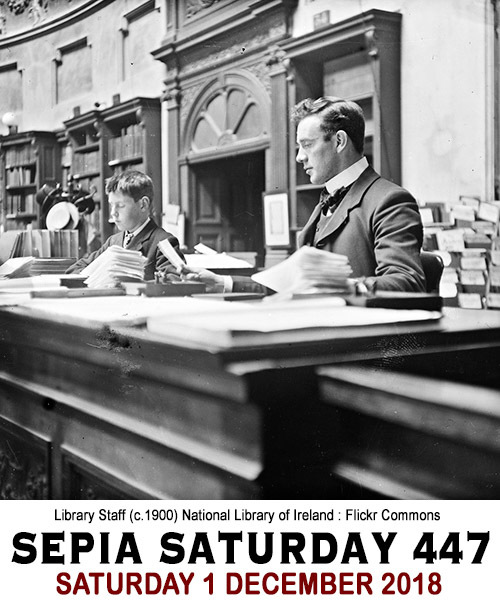 Come to think of it, libraries are a little like Sepia Saturday. So this week we are asking you to file away your old photographs, stack them on the digital shelves, and make them available for other people to borrow, look at, and appreciate. Just post you post on or around Saturday 1st December 2018 and add a link to the list below. We have theme images available for the rest of 2018 (see below), but I have not prepared any for January yet. 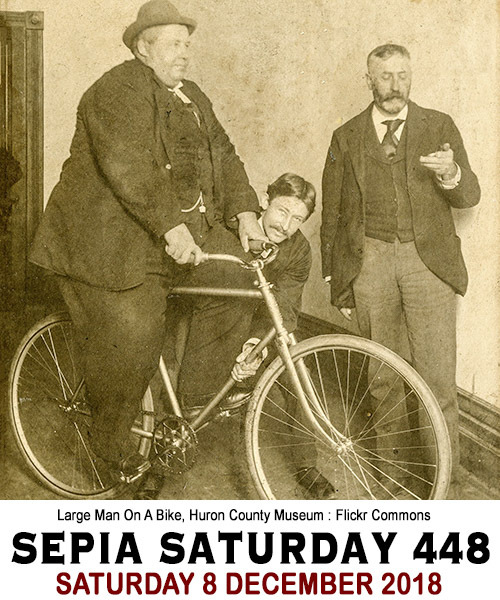 Before doing so, I wanted to consult with the remaining few loyal Sepians with regards to the future of Sepia Saturday. The number of participants has been falling off for some time now and it provides us with an opportunity to take stock and think about the future. I would like to kick the discussion off by suggesting four alternatives for your consideration. 1. 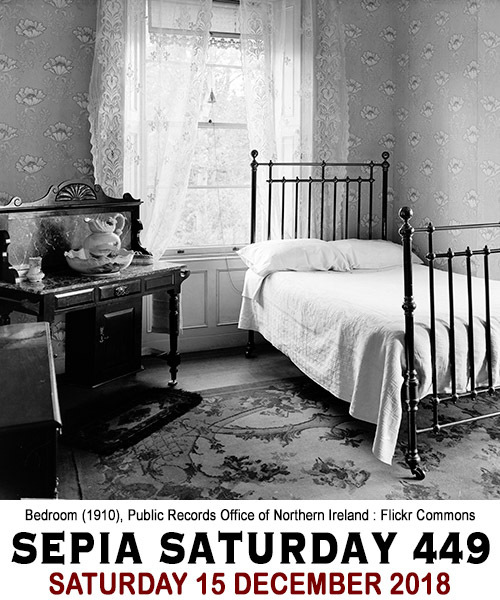 Accept that Sepia Saturday may have run its course and close it down at the end of the year. 2. Keep Sepia Saturday blog-based (centred around the Sepia Saturday Blog) but maybe have a monthly theme rather that a weekly one. People could submit multiple posts if they so wished. 3. Change Sepia Saturday into a Facebook Group. We could still have weekly theme prompts but the submissions would be handled via the Facebook Group - simply by adding a link on the Facebook Group page to your submission - be it a blog post or whatever. 4. Leave things exactly as they are. I am sure there are other possible suggestions and I would be delighted if people could put those forward for consideration. Let me know what you all think. In the meantime here are the rest of the December theme images. Do you see librarianship as a dull, and boring job? I set out to show the opposite in ten stags of my life as a Librarian. I did a lot more than just stamp books! Alan - re your thoughts on the future of Sepia Saturday. 1. No - don’t close down. SS still has a role to play in the family history blogging community. 2. I liked the monthly theme that was trialed a few years back, but there is no denying that that innovation provoked the noticeable drop in participants. I admit I am not very inventive when it comes to identifying what to write about from the recent prompt photographs, many of which I have often found quite repetitive in their themes eg. I have already done hats, fashion, bridges, rivers, shops, street scenes, arches, desks, books, couples, children, etc etc. - so,I am getting equally repetitive in my response, and now am quite selective on when I post an entry But I know other SS are able to pick upon something that I had just not spotted. I would go along with a return to a monthly theme. 3. There are many Facebook FH pages (mainly closed groups) out there which seem to be successful in attracting followers and I inspiring discussion. I see no reason why SS could not be equally successful - so certainly a possibility. I look forward to reading what other SS bloggers think. -- I would not like to see SS close down. I enjoy reading others Sepians' posts and their comments on mine, even when I am off prompt, which is often the case. I have a mailing list, but it is mostly non-bloggers who just don't comment on posts. So I value SS for the sense of community. -- I also like the weekly prompts. I post weekly, and sometime it spurs me on knowing I need to get done by Saturday so I can participate in SS. -- I also think there is a natural decline in posting around the holiday season, so perhaps Nov. and Dec. are not the best months to judge. I usually take a few weeks off myself during the holidays. I'm sharing combinations of photos of (who else) my family. I don't have a great resource of old photos like the Sepians seem to have, and only spend a little time compiling each week. My feelings are that I've really enjoyed getting to know the Sepians that are sharing, and commenting weekly...and really miss some of the others that no longer contribute. I know the FB idea would allow more people to join a closed group...where the mission statement is given at the intro to it, and members are invited to share their own topics. There needs to be something really exciting to get folks who have historic photos to join it...and I already like (follow) some frequent posters who have some excellent ones, Historic, Vintage, Appalachian, etc. I'm all for the idea of doing both for a while, if that's the consensus...maybe looking to January as a good beginning of changes. Thanks Alan, for all that you've put into this site! I see that I am number five this weekend though lately I've wondered if one day soon I might be the only blogger on Sepia Saturday. But as it is still Saturday, my contribution beats the time clock with another long story that I think is on the mark for a library theme. Musical of course. I will be very sad to see the end of our weekly club (which I imagine as a kind of Yorkshire pub minus the beer:-} but I know how hard it is to sustain this kind of venture. I am truly grateful for the dedication Alan and Marilyn have put in to keep the club going. Thank you both. As I don't do Facebook that is not a viable plan for my blog habit. The monthly theme was okay but it was awkward to figure out when people contributed and what kind of response to make. Ever since Alan developed the advance list of theme images, it's been much easier to plan my stories. Perhaps a bi-weekly theme would work better as long as it continued the advance notice, so I'd be happy with that too. But I think my preference is to continue on a weekly call, mainly because I have a LOT of photographs and my collection continues to grow. Right now I have dozens if not hundreds of good stories ready to write but I've always waited for just the right theme. This weekend is a perfect example as the photo I used has been in my collection for over 5 years and much of its history was sketched out some time ago. But I didn't really start writing it until Thursday when I suddenly remembered it had the perfect connection. So that's the reason I like Sepia Saturday and Alan's quirky choices. It makes me write. Thank you. Please, please. please do not shut down Sepia Saturday! I don't know if you will see this comment, Alan, because I am posting late. I made a comment a couple of weeks ago on this topic - fearing the demise of SS. After my lengthy illness and the chemo brain that resulted, I am finally becoming almost regular in my blogging again - but only with SS prompts. It is so enjoyable to me to have this vehicle to provide me with some direction in a fun and creative way. I missed the library prompt week, and was afraid I'd have to miss this week too, but circumstances have changed and I'll get to work on it right now!